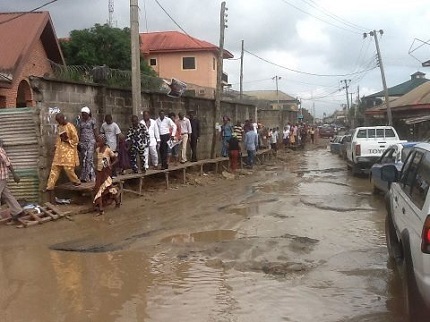 Nauvoo Times - Imo Eshiet - When in Nigeria, "Never Expect Power Always"
When in Nigeria, "Never Expect Power Always"
Nigeria is a hulking, foundering nation. Nothing captures its biting failures more succinctly than the acronym its state energy company once went by: N.E.P.A. (meaning National Electric Power Authority). However, the company more than not, with its monopoly power, immerses the nation in palpable darkness than light. I once crawled in utter darkness through some dust caked halls of one of our so-called international airports to retrieve my luggage and those of my fellow travelers because there was no power to work the conveyor belt. When done, I came out looking like a coal miner. Tons of badly needed food and industrial products cannot be preserved due to erratic power supply. Surgeons use battery-powered flashlights to carry out delicate operations. Public and college labs deteriorate because of incessant outage. Sixteen billion dollars that were voted to revamp the company and end its morass were simply pocketed by a president. And so after more than twelve hours of flight from Calabar to New York, the long journey left me tired and confused. I felt jet-lagged by the stark contrast between the miasmic dysfunction back home and the near flawless order I suddenly encountered. The difference was instantly disorienting. Unlike the sickening low voltage (when complete power outage was not the order of the day back home), there was constant power supply so much so that I had to constantly rub my eyes to make sure it was real. When I visited the restroom at the airport, there was no need to hitch up my pants and tiptoe or walk on my heels as we do in Nigerian restrooms to avoid stepping on human waste. The facility was sparkled and gleamed like alabaster. No flies buzzed, no offensive odors oozed, and no nauseating stains made me feel like hurrying away. The immigration and customs officials were professional. It was so very unlike home, where arrivals and departures at airports are as disheveling as passing through a deadly twister. As travelers to Nigeria unfortunately know, conditions there are so perfectly suited for chaos that broad daylight robbery by officials is routine. State security men commonly help themselves to whatever items in the visitor’s luggage catch their fancy and devise every stratagem to hoodwink the unsuspecting traveler. Surprisingly, no one asked me for a bribe, nor were there toughs milling around to menace and fleece me. At the check-in desk no one made any suggestions that if I parted with some money I could pay less for my excess luggage. I was pleasantly surprised I could pass through an airport without having a terrible experience. The only drama was when a security man checked one of my bags. I had brought bags of smoked fish, dried vegetable and spices to share with my folks while keeping some to tide me over until I got used American foods and flavors. When asked to unzip one of the bags, a bug fell out and the security man fled! From a distance, he ordered me to zip up and get going. I guess he was afraid he could catch something dreadful I brought from Africa. Bayo Oluwasanmi, in the above excerpt, paints the attitude of power in Nigeria towards constructive critics. Like him, someone else once observed that, “Truth is treason in the empire of lies.” I couldn’t agree more, especially in relation to the reality of my nation (if one could call it so). In the first place, the nation is itself a lie, a very big lie. A group of hotly contentious tribes that continually resist being unified, the nation was contrived in 1914 by Lugard, a Briton. Since then the tribes have been perpetually in conflict, tending more towards implosion than coming together. Three years after independence from Britain, a state of emergency was declared in the western part of the country following bloody political crises. This tendency to be at war with itself boiled over from 1966 to 1970, when the hegemony of the Hausa/Fulani oligarchy was threatened by Igbo military officers who staged a coup. The crisis snowballed into a vicious, splintering civil war, stripped the nation to its bare foundations, and claimed over two million lives east of the country. Thus from its very beginning the nation was established to be exploited. The British who founded it began the frenzied looting. The colonial power savagely sank its fangs into the timber, agricultural products and petroleum. The crises of statehood bedeviling Nigeria defy easily solution. Currently cavemen frozen in time and left behind by civilization in the untamed desert of the Muslim-dominated northern Nigeria are throwing deadly tantrums. Maddened because the rest of the country is not buying into flogging, lynching or amputating of criminals, they seek to turn the fast failing nation into a tornado alley. They go berserk because people in the South embrace Western education, which to the Sharia devotees is not only decadent but dreadfully evil. Gunning for a medieval throwback, they claim the earth is flat and the sun rotates around the planets. Because they do not embrace these and several other falsehoods, Christians and their churches are routinely bombed, leaving behind a charred and scarred trail of debris. Thus far the slaughter has maimed and claimed more than two thousand lives. From all indications, the hemorrhaging is not about abetting as efforts to stem the political twisters convulsing the nation have proved abortive. A Niger Delta community scorched by crude oil exploitation. 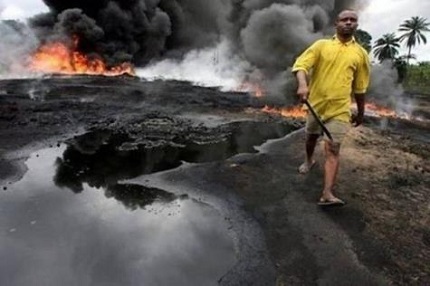 A street running with scum in the the oil-producing hub of Nigeria. 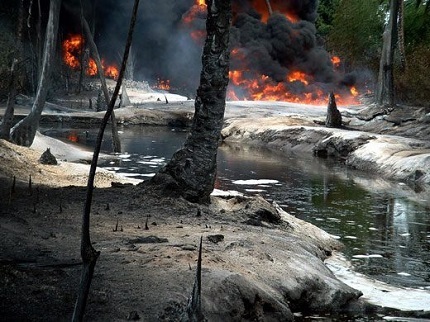 Environmental disaster in the creeks of Niger Delta.